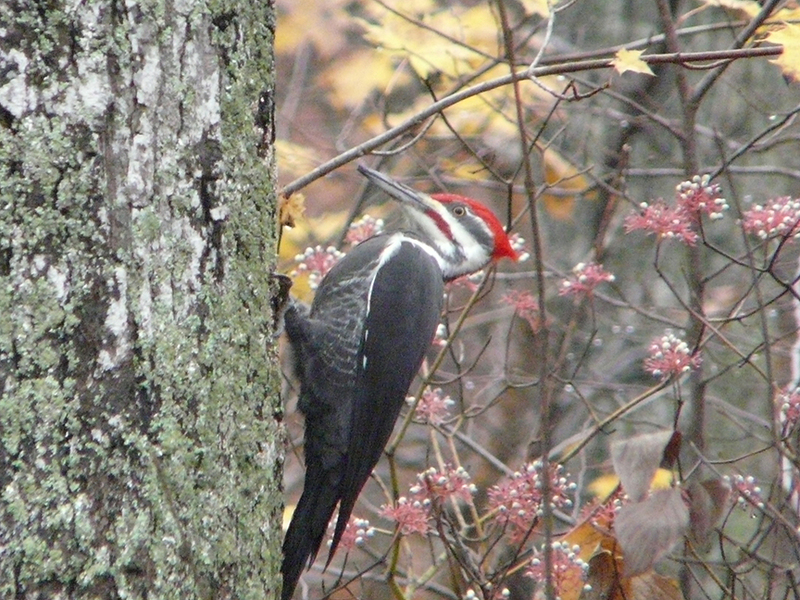 What does a Pileated Woodpecker sound like? Late yesterday while hiking the wooded Beech Hill trail with dog, I heard a loud, long cackling bird call echoing through the trees from close behind us. I’ve wandered those woods long enough to recognize the voice of a pileated woodpecker. 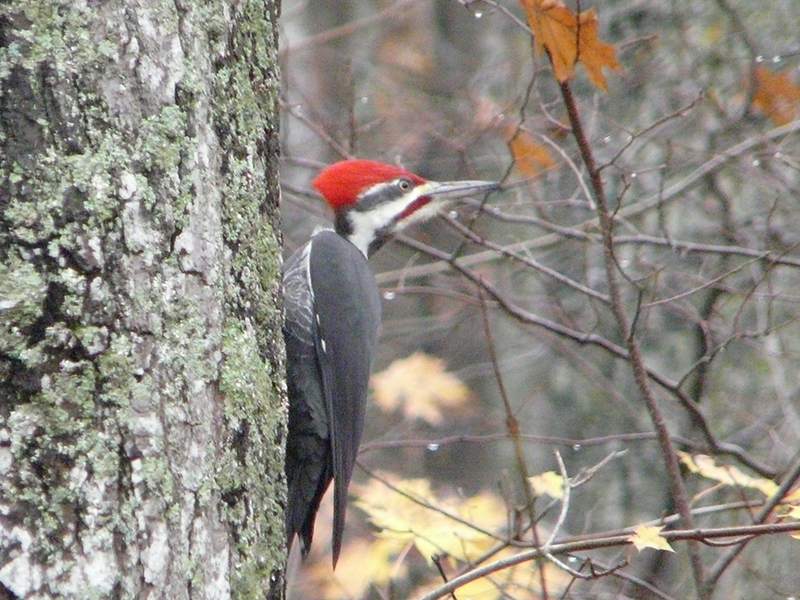 Our pileated species of woodpecker is an impressive bird if there ever was one: large and pied, with a brilliant, red Woody-Woodpecker-style crest. It’s a year-round resident, generally shy and uncommonly seen, but not exactly uncommon. Still, if you can get to know the voice of this handsome woodland species, you’re liable to double your chances of seeing one. Conveniently, there’s no other sound quite like it. The long call of a northern flicker comes close, but its staccato notes are sharper and steadier, and they clearly come from a smaller bird. A pileated’s notes seem somehow fuller, clearer, rounder—and they will vary in pitch and meter. The voice of yesterday’s bird, for instance, soared and dipped in pitch and got a little faster as it sailed over the canopy directly above us then dipped into the woods below, zig-zagging between the trunks of trees. I marveled at how long it could keep up its steady calling without (apparently) taking a breath. Ten or fifteen seconds, easy. It also has a shorter “wuk-wuk” call that it’ll use in closer conversation or to sound an alarm. Another sign of a pileated woodpecker is its style of drumming, the rhythmic hammering many woodpeckers use as an alternate form of communication. Its drumming—as you might imagine from its larger size—is louder and slower than other local species. More than once I’ve followed the sound for the reward of a great look at one of these birds. But perhaps the most conspicuous sign of pileated woodpecker activity is the crazy remnant wood-chip piles they leave after excavating tree trunks. They’re powerful birds and can carve out a giant elongated cavity in seemingly no time at all. It’s my typical formula: learn the call, see the bird, then get to know its habits. One of my routine thrills is following the bouncing, flapping flight of a crow-sized pileated woodpecker as it travels from place to place amid our mixed woodlands. If you happen to be in the woods themselves, these days, chances are good you’ll hear its call.